I mentioned in my prior “Trash Photos” post some of the creative ways Brazilians are thinking about reuse and recycling of materials from end-of-life products and their packaging. 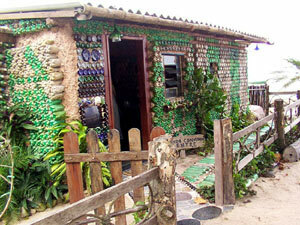 Here’s another one: constructing houses utilizing empty PET bottles. Yes, those plastic bottles everyone’s soft drinks come in these days, particularly the two-liter variety. The first I heard of this was reading about a local merchant, Célio de Oliveira, who decided to try constructing a house made with PET bottles in Magé, a community on Guanabara Bay not far from Rio de Janeiro. The article was in a 2003 article in Eco-Pop, the Brazilian website I’ve mentioned before about green activities in Rio’s favelas. If you can read Portuguese, or care to run the webpage through the Google translator, check out this link for the “PET house” story. Célio started building the house as a “social and environmental experiment.” “Social” because he enlisted the aid of about a dozen young poor boys who might otherwise have gotten into trouble in the streets. “Environmental” because he had them collect empty bottles floating in the Bay and littering the shores, with a view to exploring useful ways the recovered bottles could be used constructively. They first tried building the model house with walls made of empty bottles, but a rough storm blew it over. 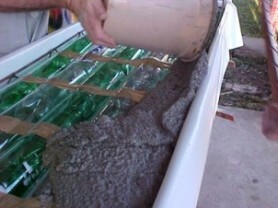 They then decided to fill the bottles with sand, giving the walls weight and greater strength. They claim it now provides excellent shelter against the weather. 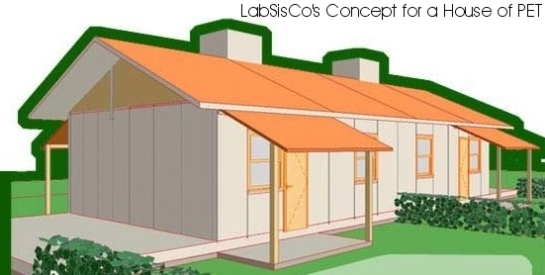 The concept of using recovered PET bottles as a construction material has so intrigued the professors and graduate students at the Federal University of Santa Catarina’s (UFSC) Construction Systems Laboratory (LabSisCo), that they are experimenting in the design and construction of homes using PET bottles as the principal component of modular wall panels. 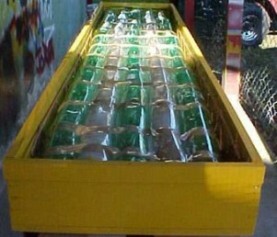 A wall section framed in wood is filled with lines of PET bottles (see picture) and then covered over with a coating of cement. The house is then constructed putting the modular pieces together. While Brazil is not the only place in Latin America experimenting creatively in eco-design utilizing recovered materials, as far as I know it is the most prolific in such experimentation. There are a number of universities, trade associations, individual companies, NGOs and even local governments promoting competitions and projects in this vein. My hope is that other LAC nations will follow suite, if they are not already. I’ll be seeking to bring other examples to these pages from other LAC nations. If you know of one, please let contact me at temasblog@temasactuales.com and I gladly will share it with others via the blog. Nice blog. On first glance, you deal with the specifics while I deal with generalities and politics. I am going to add you to my links list on “Gas”and “AC”, feel free to add us to your lists. I will peruse your blog further later. Considering that we live in a world that has finite resources, recycling or in this specific case, the reuse of materials and a good initiative. Following the example of Mr. Celio de Oliveira, who apparently has no scientific or technical knowledge of engineering, we can reuses material produced and discarded on such a large scale in Brazil and worldwide.